With the introduction of technology, public libraries aren’t a necessity like they were in the past. With information at our fingertips, in the convenience of our homes, there is less of a need to step foot in a library — yet that doesn’t mean there aren’t plenty of ways to use a library’s resources. 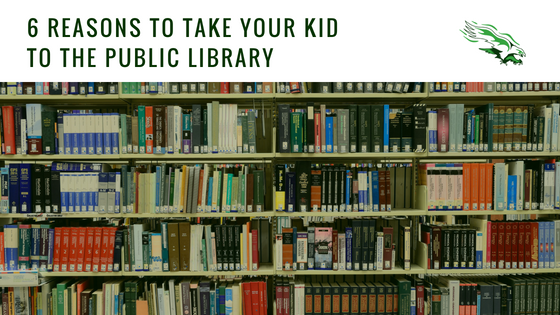 Here are 6 reasons why your child would benefit from a visit to the public library. Spending time at the local library can help to instill responsibility in your child. Borrowing books will let your child practice respecting property and taking care of things. Not only will your child learn to respect things, but he or she will also learn to respect others. Through interactions with other children and librarians, they will learn to share and find the balance between listening to others and becoming independent thinkers. Mark the return date of the borrowed books on the calendar and discuss the importance of bringing them back on time. If there’s a big family at home, the library can provide a quiet space for your child. A library not only has a wealth of information and a plethora of books but it also provides a safe place to learn and explore. Your child can roam the shelves or spread out and complete homework assignments after school. A break at the library might be just the thing your child needs to relax. Regular library visits lead to a healthy habit of reading. Plan for a library date every Tuesday after school or Saturday morning before lunch. Reading for pleasure is a positive habit to form at a young age. Books are expensive and take up a lot of room. Going to the library will give your child unlimited options and they can walk out with a pile of books that didn’t cost you a cent. A librarian that “hushes” children is something of the past. A librarian is a useful resource for recommendations for school research projects or for reading. If your child has a special interest or favorite book, a librarian can help your child find appealing reads just for them. Shake off the impression of a library being cold and quiet. Children are engaged and active and are encouraged to interact with other children and explore the shelves. Mark your calendar for the scheduled activities that the library provides. They are usually free, educational and fun for your child. Stories come to life during scheduled “storytime” when volunteers and staff members wear costumes, use puppets and bring your child’s favorite stories to life. Take advantage of the free activities and events that the library has to offer. From “storytime” for little ones to movies and speakers for young adults, there are many fun events at the library! The next time that you and your child have some free time, stop by the public library and get a library card. A library is a comforting place for your child to enjoy reading, free from distractions from the outside world.